It’s easy to see Kawasaki’s supercharged H2 as little more than a toy for the wealthy, but the supercharged technology it sports could be a taste of the future for far more mundane machines. 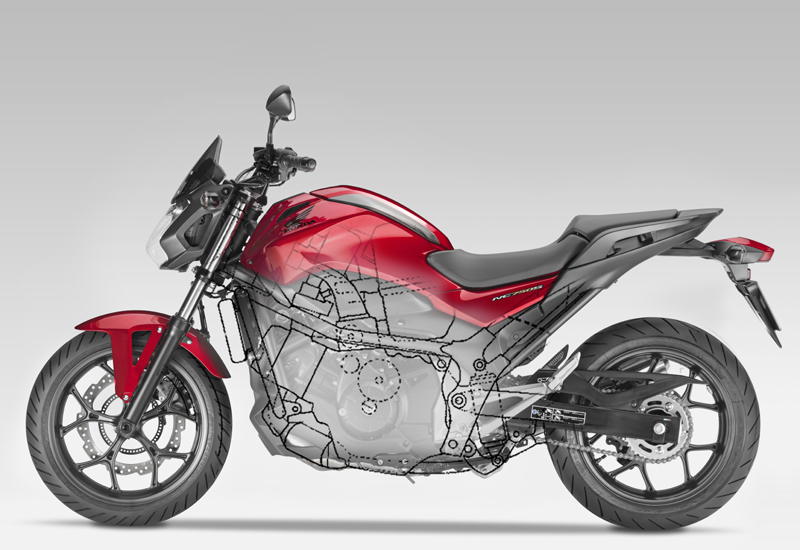 Looking at the layout shown in Honda’s patent drawings based around the NC750 parallel twin, it seems likely that supercharging has been in the firm’s plan ever since the NC750 was first mooted. The near-horizontal cylinders, which allow for a large luggage space under the dummy fuel tank on the normal NC750S and NC750X, mean there’s plenty of room to sit a crankshaft-driven supercharger and all its related pipe work on top of the engine. While that eliminates the storage space, it means the bike isn’t compromised elsewhere. Importantly, there’s even space for a large intercooler, which Kawasaki’s H2 lacks. Intercoolers are useful on any forced-induction engine because the act of compressing the intake air also creates a lot of heat. Hot intake air is less dense than cold air, harming performance. With an intercooler, boost can safely be increased. On the Honda designs, which were drawn up before the Kawasaki H2 appeared, the supercharger is mounted in a similar position to the Kawasaki’s, just behind the cylinders. It takes air from an airbox between the rider’s legs, compresses it and feeds it forwards into an air-to-air intercooler under the front of the dummy fuel tank. As on the normal NC750, the real fuel tank is under the seat. The intercooler is effectively a radiator, but instead of water it’s the intake air that runs through it. Cold air, coming in through an intake on the front of the bike, runs over the intercooler’s fins, drawing heat away. After it’s been cooled, the compressed intake air is rushed into a plenum chamber, which is a pressurised storage tank that removes pressure waves and surges from the air and means there’s always a supply of compressed air ready when the throttle is opened. The plenum chamber has two outlets: the main one feeds into the engine’s throttle body, where fuel is added before it reaches the cylinders, while a second outlet is fitted with an electronically-controlled bypass valve so if the pressure in the chamber gets too high, the engine management system can release some air from the system. Cleverly, the released air goes back into the supercharger rather than simply being vented. Just how much performance the supercharger will add is going to be largely down to the way it’s set up. However, it’s easy to imagine that it could double the stock NC750’s power, making it a 100bhp machine that would still retain most of the normally-aspirated version’s astonishing fuel economy and low emissions. Given that the first patents relating to Kawasaki’s H2 appeared nearly four years ago, we could still face quite a wait before seeing the fruits of Honda’s labours in showrooms. While supercharged or turbocharged engines are inherently glamorous thanks to their big power outputs, there are two far more sensible reasons for their increasing popularity: emissions, and economy. Kawasaki’s H2 demonstrates some of the more subtle advantages of supercharging. Some have questioned the road version’s seemingly ‘low’ power because its claimed output is identical to the normal ZX-10R, but newly-released American emissions documents for the bike reveal it scores massively well when it comes to cleanliness. The H2’s hydrocarbon emissions are down from the ZX-10R’s 0.3g/km to 0.2g/km – an impressive 33% improvement – while the carbon monoxide level drops from 3g/km to just 1g/km. Those are serious improvements for an engine that loses no power and which also benefits from a hefty boost in torque. While both surpass current emissions requirements, it’s also clear which one will be better placed to fend off future restrictions. The implication of the H2’s lower CO and HC emissions are that it will also be more fuel efficient, at least under part-throttle conditions as in the emissions test (and, most of the time, the real world). The H2 may still be a rich man’s toy, but its emissions point very clearly to where the next-generation of everyday bikes are likely to be headed.